The Division 2 is finally here, though many players have already had the chance to play it before the full release. This is because Ubisoft ran a couple of betas for The Division 2, offering a slice of the game’s opening hours to those that were eager to play. It was worth jumping in too, as there were a few The Division 2 Beta Rewards that you could earn. Having put time into the betas, many players have been wondering whether or not their progress would carry over, and in this The Division 2 Beta Rewards and Progress Guide, we’ll answer exactly that. For more on The Division 2, be sure to check out our The Division 2 Guides Hub. It’s full of useful info on the game, including a look at character customization, and which skills you should be looking at getting first. Does The Division 2 Beta Progress Carry Over? Many players put a lot of time into both of The Division 2 betas, completing the first few missions and making their first steps into The Dark Zone. As such, players are wondering whether or not all of that effort was in vain. Turns out, yes and no. 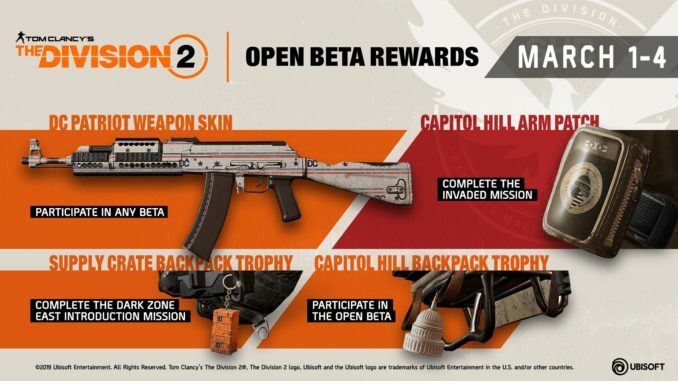 Your progress will not carry over from The Division 2 beta into the full game, but you will receive some exclusive rewards for taking part. As we mentioned before, there are a few rewards which players could earn by participating in The Division 2 betas. They range from extra cosmetic items, to a weapon skin which can be applied to almost all weapons. Let’s take a look at what is on offer. If you’re eligible for any of the rewards outlined above, you’ll need to jump through a few hoops in order to claim them. First you need to have unlocked the White House base. This is obtained near the start of the game, after the first mission. Next, you need to head to a Stash Box. Select the ‘Grants’ option and you’ll find your rewards. Some players are reporting that their The Division 2 beta rewards are not appearing in the Stash box. This is a known issue which Ubisoft has addressed. It has advised players to reboot the game and try again. We’ll be sure to update this page with a fix once we get one. So there you have it, everything you need to know about The Division 2 Beta Rewards. For more on The Division 2, why not check out our Character Customization Guide. There’s also our look at how to dodge roll in The Division 2.